Are you suffering from patchy red skin on your face? Do you have the appearance of tiny blood vessels across your cheeks? You may have what is known as a ruddy complexion. This skin irritation often has people shying away from social activities due to breakouts and insecure feelings. While there may not be a cure, there are ways to lessen the look of your red skin. We will learn about ruddy complexion causes, and possible ways to diminish the appearance of this condition. First, it is important to note that a ruddy complexion can be an inherited condition you have been living with for years, or it may suddenly appear one morning, caused by environmental factors. These factors can range from your favorite skin care products to the type of food you enjoy. In contrast, a diet of selected foods can help to treat a ruddy complexion. 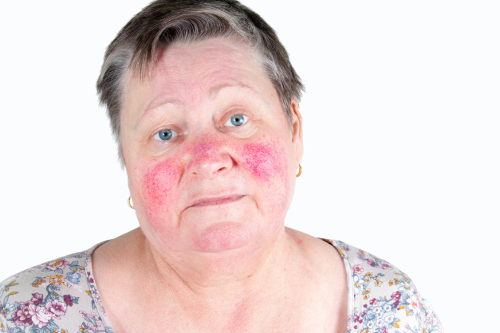 A ruddy complexion refers to red, blotchy patches that appear to be irritated. It may be embellished with tiny blood vessels, known as capillaries. When the blood vessels close to the skin become inflamed, a ruddy complexion is often the result. This condition is thought to be caused by an inherited gene or as a result of a reaction to an allergen trigger such as lotion or extreme temperatures. Many cases present as a flushing of the face. Did you recently switch to a new skin care line? Have you experienced this condition before? Are you under a great deal of stress at this time in your life? Have you been prescribed new medication? Are you cleansing your face every morning and night? Is the skin on your face extremely dry or oily? Do you protect your face with sunblock? Have you recently spent excessive time in the sun, heat, or cold? We will look at the more common causes of a ruddy complexion to determine what may be causing your red blotches. As the blood vessels lay close to the skin surface, a problem with the capillaries may be the source. The face becomes red along with the blood vessels. The underlying cause of abnormal blood vessels may not be evident, although damage to the skin from the harmful sun’s ultraviolet rays may be a factor. In keeping with ultraviolet rays, this factor along with stress and extreme temperatures may cause the development of peptides. These molecules can have a direct effect on the neurovascular and immune systems, causing the red hue and blood vessels to become inflamed and dilated. Alcohol can have an effect on the neurovascular system by stimulating the brain, causing a ruddy complexion. In some cases, the more alcohol consumed, the redder the skin becomes as the blood rushes through the blood vessels. We know mental and emotional stress can play a big part on the physical well-being of our body. The stress hormones that are released when we are feeling overwhelmed may cause a ruddy complexion as our core temperature rises. A ruddy complexion treatment focuses on the underlying cause as well as concealing the appearance of dilated blood vessels and redness. We have compiled a list of commonly used natural home remedies and lifestyle changes. It is important to clean your deep pores twice a day to remove the dirt, debris, and possible makeup. These can aggravate the pores and cause inflammation. Use warm water to open the pores and always rinse your face with cold water to close the pores. Avoid using soap and face cleansers with fragrance ingredients. These can cause the skin to become inflamed and clog the pores. Treat irritated and dry skin patches with natural skin care products that list aloe vera or cucumber as ingredients. These can help soothe painful skin and lessen the appearance of redness. You can reduce the look of a ruddy complexion by using products for sensitive skin if you use makeup daily. Choose ones that do not clog the pores. To diminish the redness of the skin, use concealers containing yellow or green undertones. These can help to hydrate the skin while creating a smoother appearance of the skin tone. Ensure your daily diet contains fruits and vegetables enriched with antioxidants such as berries, pomegranates, beans, and leafy green veggies. These can target the free radicals that stimulate the blood vessels and tissues to become inflamed. Environmental factors targeted include pollution, tobacco smoke, alcohol, and the sun. Avoid citrus fruits and nightshade vegetables like peppers and eggplant. Consume essential omega-3 fatty acids to treat and prevent inflammation such as flaxseed, walnuts, hemp seed, sea vegetables, and cold-water fish. Protect yourself from inflammation-causing foods such as peanut oil, canola oil, cottonseed oil, soy products, and deli meats. Having too much of these omega-6 fatty acids may result in a ruddy complexion. In addition to an excess of omega-6 fatty acids, limit or avoid dairy products, MSG, and spicy foods. Inflamed blood vessels and redness can also be triggered by preservatives, food dyes, white flour, sugar, and trans fats found in processed food. These ingredients are found in fast food meals, cakes, cookies, candy, chocolate bars, chips, and even some cereals. A ruddy complexion can be prevalent in those with family members with the same skin condition. The red blotchy skin can also result with the use of some skin care products, excessive alcohol use, and after consuming certain foods. Whether it is caused by a heredity gene or an environmental factor such as stress, you may be able to diminish the appearance with natural treatments. What you put in your body is just as important as what you put on your skin. While there is no magical cure for a ruddy complexion, there are things you can do today to treat the look of existing capillaries and red patches. “Top Causes of Ruddy Complexion and Ways to Treat It!” ePain Assist, March 4, 2017; https://www.epainassist.com/skin/top-causes-of-ruddy-complexion-and-ways-to-treat-it, last accessed July 10, 2017. Cespedes, A., “What Foods Help a Ruddy Complexion,” Healthy Living; http://healthyliving.azcentral.com/foods-ruddy-complexion-1003.html, last accessed July 10, 2017.